Michael Zähl, former engineer and designer of the main custom made mixing console at the legendary Conny's Studio and Mark Ernestus, long time producer known from projects like Basic Channel and Rhythm & Sound had a special encounter which led to the collaborative development of AM1 - the state-of-the-art pure analog mixing console. Mark Ernestus: "Mixing consoles are one thing I was never happy with in the past. I've checked many different things, and even though there are hundreds of mixers around now, I couldn't find one that was really close to what I wanted." Ernestus was in search for a mixing console with a consistent analog approach for a realtime workflow. While fully featured vintage mixers generally are huge and still only have stripped down stereo channels, not to mention noise or maintenance issues, Ernestus likes working with a lot of effects and therefore needs flexible routing options and more effects sends than usual. The problem - many mixers only have four or less and often not the best sound quality. These very basic criteria were very hard to find in one mixer. Some are found only in vintage consoles, and the other ones are found only in modern ones. Ernestus: "Then I also had fantsized about some more specific features, that I didn't even expect to see commercially available anywhere." Mark Ernestus came across a vintage mixer on sale online that was "relatively close" to what he was looking for, a mixer manufactured by the german company Zähl. Without finding much information on the product thus having a few questions, Ernestus encountered Michael Zähl, who provided all the information. After being sure to buy the mixer Ernestus visited the seller to find the actual product in a very bad shape. After consulting Michael Zähl, to consider if the mixer was restorable, he asked Ernestus to give him a few days time to think about it. It took almost a year to finalize the basic concept for a product fit for general users within an affordable price. Zähls emphasis was always on pure analog. Good analog sound doesn't go well together with digital controls. If you have computer and analog mixed together in a big system like a mixing desk, there is interference in high frequency, distortion and other effects. However, with a workstation on one side, high quality outboard multichannel D/A and A/D converters as a ‚bridge’ and a pure analogue console on the other side, it makes sense again. It is a good time to develop a mixer like AM1. Instead of trying to duplicate vintage mixers, Zähl and Ernestus designed it new from scratch to fit the computerized studio environment of today. For example, old mixers used to provide fader automation and total recall functions, but now these can be taken over by the computer software. So by separating the functions of computer and mixer, they knew which features had to be emphasized. This was the most important point they took into account in order to develop AM1. Ernestus: "Sometimes 'analog' is equated with 'retro', but that's not it. I prefer analog due to my work flow. I use it for realtime mixing. Your default settings and arrangements, you program them in the DAW prior to the mixing. Then you use the console for hands-on realtime mixing. With AM1, everything is placed within the reachable range of two hands, yet still compact and easy to control. For example, we chose toggle switches instead of pushbuttons for many functions because you could switch it more fluently. When you actually use it, you feel the difference. All the controls are laid out to be logical and self-explaining." The great thing about AM1 is that you can make your own configuration to fit your needs. Most notable features include the two band parametric EQs on the master return channels which is so useful when you want to manipulate the returned reverb, for example. The sound quality of the EQs is amazing too. Good EQs do more than just adjusting levels. It's almost like another instrument! 'Prepare' function is also very convenient. When you want to make a dramatic change with effects at a break during your live mixing, there are limits to what you can do with just two hands. At these occasions, you could preset and save the change to Prepare, and set it off with Set button all at once. There are more useful functions such as Zero-Cross Sensing switch which minimizes clicks, or Insert function which enables you to do parallel manipulation, various mid/side stereo conversion features, AM1 has all the features needed for artists such as Ernestus who work with a mixer like a musical instrument. The story behind AM1 is told but history is in the making. Stay tuned and take a closer look at the AM1-Details and the preview of the CV Stereo Channel Module. LEVEL LEDs for post PREAMP signal, red @ +21 dBu, yellow @ ref. level +6 dBu, green @ -24 dBu, red LED additionally monitors input signal pre GAIN stage. Highly musical design without colouring, highly effective yet sensitive. Channel-exclusive DIRECT AUX send switchable PRE INSERT/OFF/POST FADER. Very helpful when using effects on single channels in combination with INSERT. Individually set send level at DIRECT AUX and INSERT RETURN DRY/WET RATIO. Use toggle switch for momentary effects (Click-free audio switching). INSERT point switchable PRE EQ/OFF/POST EQ. Continuously variable mixing RATIO of DRY (original channel signal) and WET (INSERT RETURN signal) for parallel compression, parallel EQing, or for use as channel-exclusive aux return when used in combination with DIRECT AUX, thus freeing up aux busses when using an effect on one channel only. Stereo LEFT and RIGHT INSERT send signals are converted to MID and SIDE signals. Respectively INSERT return expects MID and SIDE signals and converts them back to LEFT and RIGHT for further signal treatment in the channel resp. mix. Narrow STEREO BASE by turning counterclockwise towards MONO. Widen STEREO BASE by turning clockwise towards DIFFERENTIAL signal. There is a jumper-selectable hard/soft option for the DIFFERENTIAL signal. PRE FADER/OFF/POST FADER toggle switches for maximum tactile control and precise timing especially for momentary effects (Click-free audio switching). Both PRE FADER and POST FADER signals are generated after PANORAMA stages. Thus stereo image is always preserved on stereo AUX outputs. Dedicated PANORAMA controls for left and right channels (potentiometers with trimmed center-click). Maximum flexibility for stereo positioning in the mix, especially in combination with STEREO BASE control and preamp BALANCE control. Stereo PFL (Pre Fade Listening) applies to CONTROL MONITOR only (non-destructive). SOLO (solo-in-place) applies to MIX and cuts all sources which are not in SOLO state. Global mode selection (PFL or SOLO) and global reset function are located on Master Module. Switching audio signals can lead to clicks, especially when interrupting a low frequency signal at its wave maximum. One way to avoid this is to apply a very short fade using VCA technology, which for sound quality reasons was not an option for AM1 design. AM1 uses zero cross detection. Signals are switched on or off when the wave crosses zero level - thus preserving hard audio switching and at the same time preventing annoying clicks. This function is effective on CHANNEL ON/MUTE, MIX bus and AUX toggle switches. Precision CHANNEL FADER (Penny&Giles 104 mm) with fader start switch. MIX and GROUP assign switches for stereo MIX and stereo GROUPS 1-4. Both PRE FADER and POST FADER signals are generated after PANORAMA stage. Thus stereo image is always preserved on stereo AUX outputs. PANORAMA stage with CENTER LOCK button for precise center level. 4 stereo inputs, SOURCE SELECT buttons are MIX and 3 external STEREO sources. PFL automatically takes over when active. MASTER LEVEL METER monitors PFL signal when PFL is active. CONTROL MONITOR PHONES section follows all settings and functional states of CONTROL MONITOR except for level potentiometer and SPEAKER/ALTERNATIVE SPEAKER ON/OFF. The high power PHONES amplifier provides its own level control and a large illuminated ON/OFF button. 3 stereo inputs, SOURCE SELECT buttons are MIX, AUX 1 MASTER and one external STEREO source. PFL TRIM can be used to attenuate PFL summing signal. Adapting the level may be necessary in case of multiple PFL selection. MUTE CONTROL provides smart functions for building mute scenes on the fly. On any channels set PREPARE buttons to the state (ON or OFF) you want the respective CHANNEL ON/MUTE buttons to be next. Pushing SWAP instead of SET, PREPARE buttons and CHANNEL ON/MUTE buttons will exchange theirs state. Another push on SWAP and you are back where you started. Channels to be triggered by MUTE CONTROL can be enabled or disabled one by one or globally. PFL/SOLO button with same functionality as channel. Special function with SOLO: Channels, which are routed to GROUP stay active concerning their respective group routing and their POST FADER AUX SEND signals. MIX INSERT is located post summing amp/pre MIX FADER. INSERT ON switches INSERT into the signal path. M/S activates the integrated MID/SIDE functionality: Stereo LEFT and RIGHT INSERT send signals are converted to MID and SIDE signals. Respectively INSERT return expects MID and SIDE signals and converts them back to LEFT and RIGHT for further signal treatment in the mix. Precision MIX FADER (Penny&Giles 104 mm) with fader start switch. for merging outputs from other external console with busses of AM1 console preserving maximum quality and flexibility. Balanced inputs with internally adjustable gain. Each bus with switch for deactivating unused input in order to minimize noise floor. The module can also serve for setting up an AM1 system consisting of two or more units (main console and extenders). Multipin connectors for MIX, GROUP 1-4, AUX 1-6, PFL and SOLO/PFL LOGIC inputs. - AR ENVELOPE generator with ATTACK and RELEASE control, selectable trigger SOURCE and MANUAL trigger button. 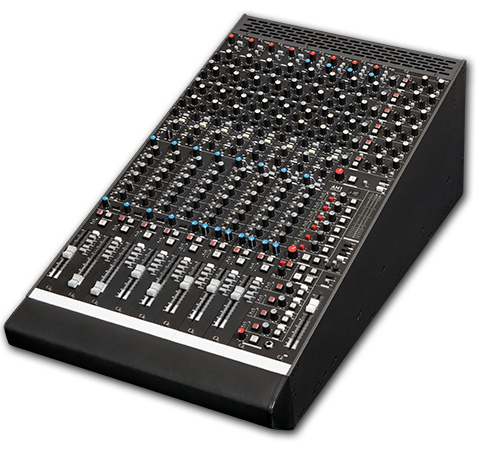 The AM1 is available in a wide range of formats - large recording console with numerous channels or small mixing desk (from 19" width on!) in a musicians studio, PostPro or Mastering environment - only as built-to-order. Built-to-order - Zähl guarantees the highest level of quality. The mixing console is manufactured	from scratch and in Germany - We don't make mass products - your AM1 can be customized and configured to your personal requirements. If you are interested you are more than welcome to discuss your questions and requirements with Michael Zähl.